ALASKA Milk bolstered its frontline on Tuesday with the acquisition of former PBA MVP Eric Menk from GlobalPort in exchange for the Aces' two second-round picks in the PBA rookie draft. The Aces dealt the fifth and seventh picks of the second round to get their hands on Menk, the wide-bodied Fil-American banger who is expected to back up Sonny Thoss in the frontline. The deal was immediately approved by PBA commissioner Chito Salud Monday afternoon. Menk, 39, should provide extra firepower for the Aces, who are out to match the frontline of other tall teams in the league like San Miguel Beer, Barangay Ginebra and San Mig Super Coffee. The Aces will be Menk’s fourth team since entering the league as a direct hire by Tanduay Rhum Masters in 1999. 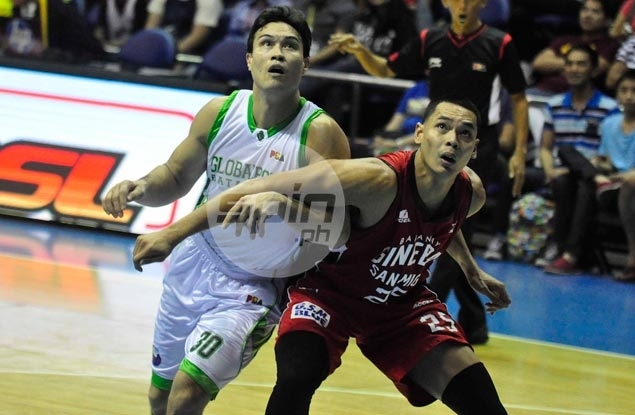 He spent his best seasons with Ginebra before returning from a layoff to join the GlobalPort camp last season. Menk also spent time with San Miguel Beer's team in the Asean Basketball League (ABL). An Alaska insider bared Menk, a 14-year veteran, will be used as a cover since big man Gabby Espinas is expected to miss the the first four months of the next season due to a fractured ankle. Another source, however, bared that the move might be Alaska's preparation for a another trade especially now that Sam Eman is reportedly being eyed by other teams including Rain or Shine.